To Ranen on the "Ships starting with R" page. Contracted in March-1914 but due to problems with deliveries of materials the building took a long time, and she was not delivered until March-1918 from Storvik Mek. Verksted, Kristiansund (7), 399 gt, 224 net, 138' 5"/148' 6" (loa/lpp) x 23' x 16' 10", Triple exp. steam engine 463 ihp, 11.5 knots, 177 passengers. In local passenger/cargo service around Helgeland. In 1918 she was hired out to the Norwegian Navy, until the end of the war. In the period 1919-1924 she was on hire to various companies in addition to being used in her regular service, mostly in the Rana route, then in the period June 21-Apr.-1922 she was hired out to Vesteraalens Dampskibsselskab as replacement for Mosken which had been lost. In July-1924 Ranen was placed in the new Trondheim-Harstad route. Ran aground on Nov. 23-1924 near Leikua lighthouse north of Vallersund. Went to Mjellem & Karlsen, Bergen in 1927 in order to be rebuilt and lengthened, but due to a strike at the yard she was completed at Sandnessjøen Slip, 463 gt, 263 net, 168' 9" oa. Ran aground in Sund, Salten on Jan. 23-1933, refloated. Drifted against Kong Harald while at Rørvik on Febr. 9-1934, minor damages. Seized by British forces in Harstad on May 19-1940 and taken to the U.K. According to a document I've received from the National Archives of Norway, she was at Aberdeen (with damage) on June 13 that year. Left Aberdeen on June 21, arrived Rosyth June 23. Under the command of the Royal Navy in the period 1940-Dec.-1943, then transferred to Nortraship's register on Dec. 2-1943. 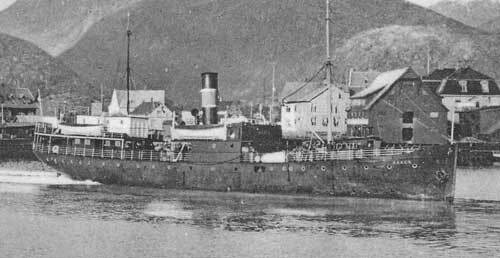 Returned to owners in June-1945 and placed in service Trondheim-Harstad. According to the archive document mentioned above, she had left Leith on June 19-1945, arriving Methil Roads that same day, departing again for Norway the next day; arrival Norway is not given. In Dec.-1954 she was transferred to Skipsaksjeselskapet Rana. Sold in March-1958 to Angelos P. Venetsanor, Piræus and renamed Panagis Venetsanos. Deleted from register in 1964. Back to Ranen on the "Ships starting with R" page. The text on this page was compiled with the help of: Company fleet list and misc.